To access your rewards credit card program information, sign in to Online Banking, and click Go to my credit card rewards button. Learn more about choosing the right rewards credit card or choose from our full selection of credit cards by visiting our credit cards overview page. You can redeem your credit card rewards on your mobile device, on our website or by phone. Sign in to the Mobile Banking app and tap the View My Rewards link to view/redeem available rewards balance. You can also tap the Erica icon and say, “I want to redeem credit card rewards” and follow the instructions (if you prefer, you can also type your message to Erica). To check your credit card rewards balance and cash in or redeem your rewards points online, sign in to Online Banking and select your credit card then select the Rewards tab. 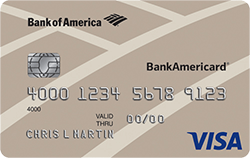 To redeem your credit card rewards by phone, call 800.434.8313 and select option 2 (Mon-Fri 9 a.m.-9 p.m. ET). Certain cash reward redemption options have no minimum requirements, so you can start redeeming as soon as you start earning. Points rewards redemption options start at 2,500 points. Online Banking customers can check rewards balance, review redemption details or redeem rewards by signing into Online Banking or by using our Mobile Banking app. The guide to benefits that was sent to you with your credit card contains all the benefits details. If you need to obtain a copy of your benefits guide, please call the number on the back of your credit card. To discuss benefits, call 800.592.4089 (outside the U.S., call 804.673.1468 collect).